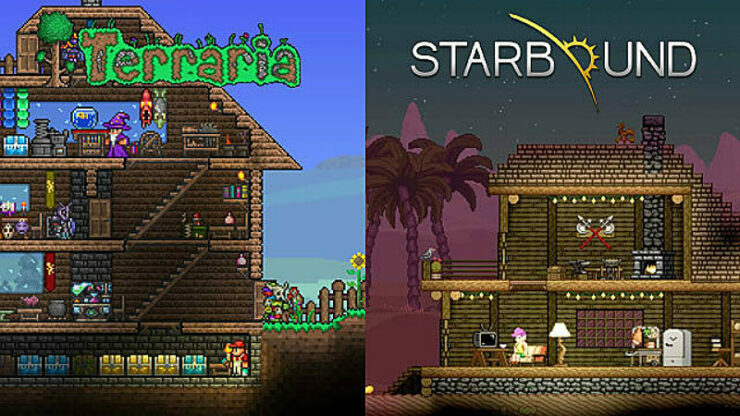 Starbound vs Terraria – Which is better? Starts in the middle of nowhere like Minecraft. A tutorial is provided introducing the basics, done by an NPC. Starts off at a graduation ceremony being under attack by a tentacle monster. A tutorial is done by a guide device while the player escapes from the apocalypse. Allows for free exploration by the player. Story-driven, w/ main quests that suggest progress. Story can be ignored to progress at your own pace. More pixelated art that gives a nostalgic feeling. Smoother graphics with realistic shadows and lighting. Has control options that can be rearranged and easier to tell which key does what. Does not have control options, need to test out on your own (e.g. some controls are not taught in the game such as holding shift to place 1×1 blocks). A near boundless world for players to build and create in, w/ many large biomes spread out randomly. Landscape is unique in each area. Environments have varying degrees of difficulty levels that are stumbled upon by luck. More difficult to track location, which makes exploring more challenging. Only has 2 dungeons to explore, NPC villages have similar types of villagers. A huge universe with countless galaxies, solar systems, and planets to explore, each planet w/ a different main biome and several sub-biomes. Planets look similar to each other. Planets can be terraformed into biomes of your choice. Planets have increasing difficulty levels and more dangerous planets have better ores (solar systems: radiation > cold > hot). You always know where you are, it is impossible to get lost as each planet goes in a full circle. Has lots of different types of underground dungeons, tombs, hunting grounds, underwater cities, and villages. Each race has it’s own themed furniture, villages, items, artifacts, and architecture. Traveling is made easy as they are flags that can bookmark useful places to come back later. Tiers are separated by ores and the tools crafted with them. Has cooking element but no hunger to use it on, food is used to make potions that have different effects. Weather has minimal effect on the player. Has different types of potions to heal different types of status effects. Can sell things for a lot of profit, which makes trading quite useful. There is no quick way to escape from danger and the player must be cautious at all times. Expert – stronger monsters, more coin and item drops. Hunger levels need to be taken care of, and different food items have different effects (healing, stat buffs); food has expiry. Temperature/climate changes affect body (hot, cold and high radiation planets require certain equipment). Has limited variety of healing items, two for HP and two for HP and status effects. Can sell things but the profit margin is too low except for a few expensive items. Casual mode has little risk of dying because can beam back up to ship almost anytime anywhere. Casual – no hunger, 10% loss of Pixels. Survival – hunger, drop items 30% loss of Pixels (items could be retrieved from the ground at the place of death). Easy mining with an upgradable pickaxe that can increase mining speed, power, and mined minerals. Breaks one block at a time, more tedious and time-consuming mining. Well thought out “tech tree” where mining efficiency increases steadily. Different types of axes and tools to gather different materials. Progressive mining with an upgradable matter manipulator (space plasma cutter that breaks and extracts blocks) that is given at the start of the game or a self crafted pickaxe). Matter manipulator can break up to 5×5 blocks at a time and can also extract liquid and provide item descriptions. Mining is at a slow rate at first until upgrades are available. One matter manipulator can pretty much do anything, which renders the pickaxe useless. Gear needs to be crafted often throughout the game. Items need to be handcrafted with detailed crafting recipes, which makes crafting more interesting. Gear needs to be crafted only from time to time as planets become more difficult. Items are crafted with just a click of a button at the required crafting table (there are different types of crafting tables), which makes crafting more convenient. Lots of decorative blocks for building. Building a house is more for practical purposes like staying safe or building boss arenas. Background space is filled by crafting block walls. More time consuming to build due to insensitive building mechanism. Blocks can be shaped with a hammer. Buildings look choppy and old-fashioned due to pixel graphics. Incredibly massive amount of decorative blocks for building. Building is largely optional in gameplay because you have an upgradable spaceship (hosting NPCs, placing furniture, farming). Blocks can be placed in the background by right-clicking. Very quick building (responsive brick placement, farther reach, blocks can be placed 2×2 or 1×1). Sloped blocks can be placed. Buildings look prettier due to better graphics and you can build gorgeous castles with realistic interior shading. There are many types of wood that can be used to make different types of furniture. Furniture can be crafted using different kinds of materials, but they have a similar appearance. There is only one type of wood (even though the trees look different). Each race has tons of different themed furniture that look completely different, and can be scanned and printed using pixel currency. Only blocks can be recolored. You can build your own space station in outer space and upgrade it using ores. Fish can be collected and put into an aquarium. Critters from different planets can be collected and placed into houses. Fossils can be dug up and displayed in cases. Pets can be put up on display. Better melee swings i.e. wider hits and more flexible angles. 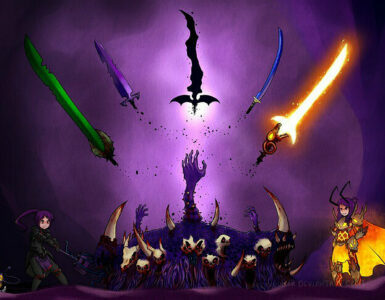 Hundred types of weapons and magic spells with a wide range of effects, and you can choose your own combat style. More aggressive combat that focuses on attacking and dodging. Has higher variety of accessories that can boost character stats. Anything below the knee cannot be hit unless you crouch down (cannot hit monsters on cliffs but will get hit). Infinite number of weapons, some weapons have special attack abilities, but their functionality is still too similar. More strategic combat that focuses on blocking against attacks. Some weapons are two-handed and some are one-handed; allows player to dual wield two weapons. Bosses are more challenging to defeat and require agile movements and a lot of running and flying around. Some bosses need to be fought with self-constructed boss arenas with traps, which encourages creativity and wiring. Many different types of monsters with different attacks. Bosses are quite challenging but attack in a set pattern that is easily observable; battleground is in a confined area. Infinite types of monsters but with similar attacks. Space battles are made possible by traveling in mechs and fighting enemy ships (mechs have laser cannons, power drills, and mecha swords). Optional boss battles that are triggered by the player. The world changes after each boss is defeated. Bosses can be skipped according to ability. More choices in tech upgrades. Main quests to follow through, with 7 main boss battles. Progression is linear and limited to the main storyline. All bosses must be defeated to complete the game. Linear and limited tech upgrades. Different types on NPCs (appearance, services). NPCs have more unique and distinguishable features so you know what they do or sell. Merchants sell loads of different things in different places. More variety of dialogue (NPCs gossip and call the names of other NPCs), more interactive. NPCs are memorable and immersive; makes you emotionally attached to them. NPCs seem to appear out of nowhere. NPCs can be spawned inside houses with basic furniture and some additional achievement requirements. Many more types of NPCs (race, services, personalities). Hard to know explicitly what services each NPC offers as they have similar faces, and items sold are random. Each merchant only sells a limited amount of items. Less variety of dialogue (villagers repeat sentences; crew members describe their surroundings). NPCs can be hired as crew members to fight alongside the player or boost stats for the player and the spaceship. The universe feels populated by many NPC villages. NPCs can be spawned as tenants using a colony deed and furniture in the room decides the type of tenant spawned. Tenants pay rent or give items every day. NPCs can interact with furniture. NPCs can be hostile or passive (bandits can attack you with guns undermines. Pets can be found in chests and as boss drops. Pets are used for stat buffs and cosmetic purposes, and have infinite health. Minions can be summoned to fight for the player. You can have one minion, one passive pet, one mountable pet, and one light giving pet out at the same time. Monsters can be captured at low health as pets like Pokemon. Pets are used for combat purposes, have limited health and need to be healed at a healing station. You can only have one pet out each time, but you can have crew members following you along with your pet. No daily quests except fishing. Other quests are in the form of events like giving out themed items and fighting unique bosses (flesh walls, pumpkin invasion, pirates, snowmen, meteorites, aliens, eyeballs, worms, robots, skeletons, etc.). NPCs give quests related to other NPCs and reward money or items; quests have low diversity (saving NPCs, bringing them back home, killing bad guys, finding items, growing crops, delivering messages). NPC quests help recruit crew members to expand the ship and fight together. Clever wiring system that can make powerful traps and intelligent gadgets like item farms and boss arenas. Wiring occupies a lot of space. Logic gates are later added in an update. Simple wiring system that requires minimal knowledge to use and can make neat traps. Logic gates are as versatile as redstone in Minecraft, but take up much less space. Logic gates are complete but there are not enough components that can interact w/ it. Less starter customization (hairstyles, gender, color paletter). Color is picked by a slider, more flexible but bad for colorblind people. Not as good character creation UI. There are separate slots for visual appearance items and armor, so you can wear more appealing clothes on top while wearing better stat armor underneath. More starter customization (alien race, gender, color palette, clothing style, and color posture/personality). Color selection is changed from slider to a menu of preset colors. Catchy and memorable music that sounds electronic with 8-bit style. Special music reserved only for boss battles to brighten the atmosphere. High-quality OST that features ambient galactic-themed music. Music is played for every hostile encounter which is a bit redundant. Every update refreshes the game to feel brand new, does not rely on mods for content. Developers do not actively update the game, depends heavily on modded content to keep the game interesting. Mods are hard to find and difficult to make. The modding community is huge and the game is very easy to mod. More replay-able as it focuses on the sandbox experience more than the adventure; players know what to expect and they will gladly find their own purpose. Less replay-able as it’s main focus is the story which ends quickly and the game then becomes a sandbox game, which may leave players with a feeling of emptiness. 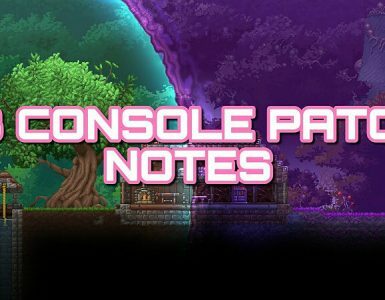 Terraria is more suited for people who like pure sandbox gameplay without a story and want to fight tougher bosses in good combat environments. 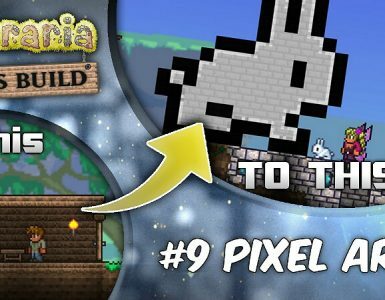 Terraria has a steeper learning curve and dying will render a higher penalty which makes the game more challenging. This makes multiplayer more necessary to ease the difficulty by cooperation. The complex wiring system also allows players to make intelligent mechanisms that can help farm useful items or fight bosses. Terraria: Wins by combat and survival. Starbound is more suited for people who like to follow a story and explore a vast universe befriending new races of aliens and fighting their way through dungeons. Crew members can also protect the player. The story is a bit lackluster though, and the main quests can sometimes be tedious like having to scan village furniture. To make things more interesting. Starbound has an extremely full building system with fossils, exotic furniture, aquariums. tenants, and space stations. Anything can be picked up, even birds and living fish, using a relocator. Starbound: Wins by exploration and builds. This is really just my opinion, and if you guys have anything to add to it please feel free to leave it in the comments.